11. Остров сокровищ. Карта капитана Флинта (Ostrov Sokrovisch. Karta Kapitana Flinta [Film 1]) (Treasure Island 1. Captain Flint’s Map). Director: David Cherkassky. Production: Kievnauchfilm (Kiev Science Film), Kiev, Ukraine, USSR. 1986. 48 minutes. This is a two-part Soviet TV movie; a wild and zany adaptation of Stevenson’s novel that was clearly heavily influenced by Terry Gilliam’s animation for the British TV comedy Monty Python’s Flying Circus. There is some live action, particularly in the first four minutes of each part, of grotesquely costumed pirates leering into the camera as they try to humorously kill each other. But it is mostly animation, in the art style of popular cartoonist Radna Sakhaltuev. Despite its crazy humor, it is a pretty faithful adaptation of the novel. I won’t try to describe it. Here is the complete film (Part l and Part 2, above); see for yourself. After the two TV parts two years apart, it has always been reshown on TV and as a DVD as a single feature. 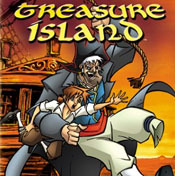 There was a 1992 American video release as Return to Treasure Island. There was a legal controversy in 2012 when Russia was about to pass a law outlawing movies or DVDs aimed at minors showing drinking or smoking, since the pirates in Treasure Island are always swigging rum and getting comically drunk. The public protest in favor of Treasure Island was so strong that the law was amended to except “movies that have significant historical and cultural value”. Like Treasure Island. 12. Treasure Island. Screenplay: Paul Leadon. Producers: Roz Phillips, Tom Stacey. Production: Burbank Films Australia. 1987. 50 minutes. If this movie had a director, he wasn’t letting his name be associated with it. Burbank Films Australia was a Sydney animation studio that specialized in producing “features” of public domain literary classics designed to be saleable as one-hour (minus commercials) TV movies – sort of an animated cartoon version of Classics Comics. Its production of Treasure Island, in a relatively realistic art style, is perfectly straightforward and “boring” (like all of Burbank Films’ films). On the other hand, it is one of the most accurate animated versions of Stevenson’s novel. The story makes it dramatic rather than cute. The DVD shown here is misidentified as the 1987 USSR (Ukrainian) version. 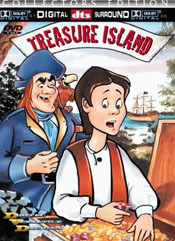 Starting about 1990, the home video market became full of animated versions of Treasure Island; both the release of old theatrical features and TV movies, and new cartoons made just for VHS sales. These increased after the transition to DVDs around 2000. Many of these have just been dumped onto the DVD kiddy market without any production credits, and sometimes without even release dates. I have done my best to track these down. 13. The Adventures of Ronald McDonald: McTreasure Island. Animation director: Walter Kubiak. Animation director: Katsumi Takasuga. Producer: Christopher Brough. Production: DiC Entertainment. February 7, 1990. 30 minutes. This is probably the most unusual production of “Treasure Island”. It was released as a 30 minute Hi-Tops Video for purchase in the McDonald’s 10,000+ fast-food restaurants. Reading between the lines of the different copyright and production names in the credits, it was commissioned by the McDonald’s Corporation through Christopher Brough Productions, who contracted with DiC Entertainment to produce the half-hour home video. DiC’s staff designed the story, and subcontracted to Korumi Studios in Japan for the actual animation, which was returned to DiC for the post-production. The finished film was turned over to Heron Communications Inc. for production as a half-hour Hi-Tops Video. It was produced during 1989, and went on sale at McDonald’s restaurants on February 7, 1990 for $9.95. IMDb’s summary is: “When Ronald McDonald and his McDonaldland friends Grimace, Birdie, and Hamburglar find themselves transported into a magic story book, they find themselves on Treasure island. With the help of a new friend, Jim Hawkins, they set out to find the buried Treasure, before the evil pirate, Long John Silver finds it first.” The video cover says that this is for ages 2 to 7. Grimace is the big purple blob; Birdie and Hamburglar are obvious. “McTreasure Island” was a one-shot, unrelated to the six similar 40-minute “The Wacky Adventures of Ronald McDonald” combination live-action/animation videos produced by Klasky-Csupo a decade later; although the second of those was a very loose version of it. Post by The Wacky Adventures of Ronald McDonald. 14. Treasure Island. Production: Fuji-TV. 1991. 29 minutes. This is probably the most problematic production. The only information about it is: “Uncertain; more information required”. It is not included in a list of Fuji-TV 1991 productions. 15. Treasure Island. Director: Diane Eskenazi. Production: Golden Films. 1992. 48 minutes. Released on Sony Wonder’s Enchanted Tales home videos. An adaption for young children with lots of singing & dancing, and anthropomorphized incidental animals, but an otherwise straight adaptation of Stevenson’s story. 16. Return to Treasure Island. Director: David Cherkasskiy. Production: Liberty International. April 20, 1994. 73 minutes. Despite the title’s promise of a sequel, this is just another version of Stevenson’s novel. As the exaggerated cartoony art style implies, lots of slapstick humor is added. Cherkasskiy was also the director of the gonzo 1986-1988 Kievnauchfilm Captain Flint’s Map/Treasures, but this is apparently a separate production. 17. The Legends of Treasure Island. Director: Dino Athannassiou. Production: FilmFair. 26 TV episodes in two seasons of 13 episodes each; September 10, 1993-December 3, 1993 and April 4, 1995-June 27, 1995. 30 minutes each. This was a British production for Central Independent Television; an extremely loose adaptation of Treasure Island with an all-funny-animal cast. Jim Hawkins and most of the “good” characters are dogs. (Squire Trelawney is a chicken-looking pigeon.) 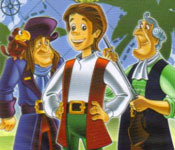 Long John Silver, a fox, is a thorough villain; and Pew (not blind), a rat with glowing eyes, appears throughout the series as Silver’s untrustworthy partner. A major new character is Jane, a vixen (officially, but she looks more like a cat) Jim’s age, who escapes from Silver and joins the good characters. The story is padded with magic and such characters as ghosts, devils, mermaids & mermen. 18. Muppet Treasure Island. Director: Brian Henson. Production: Jim Henson Productions. February 16, 1996. 95 minutes. Not animation (and thus Jerry Beck would prefer I ignore it), but thematically it goes here. A puppet loose adaptation of the novel with a human Jim Hawkins (Kevin Bishop) and Long John Silver (Tim Curry). Kermit the frog is Captain Smollett, Dr. Bunsen Honeydew is Dr. Livesey, Fozzie Bear is Squire Trelawney’s son, Miss Piggy is an Amazonian Benjamina Gunn, and the other Muppet regulars play assorted roles. A theatrical release by Walt Disney Pictures. 19. Treasure Island. Director: Dino Athannassiou. Production: FilmFair. 1997. 91 minutes. 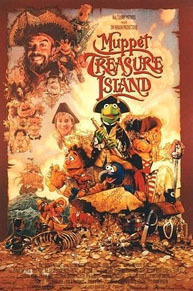 A British direct-to-video movie edited from the 1993 The Legends of Treasure Island funny-animal British TV series. 20. Outlaw Star. Director: Mitsuru Hongo. Production: Sunrise, Inc. 26 episodes, January 8, 1998 to June 25, 1998. 30 minutes each. This was a TV anime adaptation of Takehiko Ito’s s-f manga, a “Space Western” which was not really based on Treasure Island, but was clearly heavily influenced by it. In a far-future galactic civilization, 20-year-old Gene Starwind and his 11-year-old wunderkind partner Jim Hawking are poor jacks-of-all-trades on the planet Sentinel III. They take a job as bodyguards for a “businesswoman” who is really the notorious lone space pirate “Hot Ice” Hilda. Hilda is about to claim a mysterious spaceship, but they are attacked by the Pirate Guild and Hilda is killed. Just before dying, she reveals that the spaceship is connected with the “Galactic Leyline”, a fabled place of tremendous treasure and power. Gene and Jim escape in the spaceship, which they name the “Outlaw Star”, and, unable to stay on Sentinel III, they resolve to find the Galactic Leyline themselves. Jim Hawking is clearly a combination of Jim Hawkins and famous scientist Stephen Hawking, and the plot of a search-race against villainous adversaries for a lost galactic treasure, gradually adding colorful companions and enemies, is the same. One of my favorite TV anime series. 21. The Wacky Adventures of Ronald McDonald: The Legend of Grimace Island. Artistic Director: Laslo Nosok; Animation Director: Jim Duffy. Production: Klasky-Csupo, Inc. January 1999. 40 minutes. After eight years, McDonald’s Corporation hired the Klasky-Csupo studio to produce six new home videos to be sold at McDonald’s restaurants. Each was animation with a live-action beginning and ending. 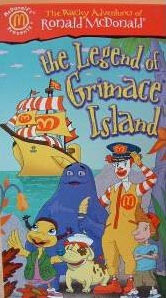 The Legend of Grimace Island, the second, was really an original work only reminiscent of Treasure Island. Grimace receives a letter supposedly from King Gunga of Grimace Island, the legendary home of the Grimaces, asking him to come save them and their treasure. He calls Ronald McDonald and Sundae, his dog, for help (live-action). Ronald (animated) creates a galleon painted in the McDonald’s colors of bright yellow & red, and he captains it with a crew of Sundae, Grimace, the Hamburglar, Birdie the Early Bird, and Franklin the boy, and they sail for Grimace Island. They are followed in a submarine by the pirate Captain One-Eyed Sally, her first mate Blather (who is one-legged like Long John Silver but is a midget, and talks “Arrr” pirate talk”), and three McNugget Buddies who want to play pirate. One-Eyed Sally sent Grimace the false letter so he would lead the pirates to Grimace Island and the treasure. Ronald encourages the timid Grimace to stand up to the pirates and save the treasure for King Gunga. After the adventure, Ronald (live-action) shows home movies of them on the island. 22. Treasure Planet. Directors: Ron Clements and John Musker. Production: Walt Disney Pictures. November 27, 2002. 95 minutes. Disney’s science-fictionalization of Stevenson’s novel. Jim Hawkins is a rebellious older teenager; Long John Silver is a gruff, fatherly cyborg; Dr. Livesey and Squire Trelawney are combined in the dog-man Dr. Doppler; Captain Smollett is replaced by the cat-woman Captain Amelia; Ben Gunn is B.E.N., a comedy-relief robot; and so on. Although the movie is well-written and richly animated, and builds to a touching son-father bonding between Jim and Silver, Treasure Planet is notoriously one of Disney’s greatest failures, officially costing $140,000,000 (and rumored to have cost a lot more) and earning back only $109,578,115 on its initial release. 23. Treasure Island. Director: Will Meugniot. Production: DiC Entertainment. December 1, 2002. 75 minutes. Originally the ninth Nickelodeon Sunday Movie Toons, a series of animated made-for-TV movies featuring either public-domain literature or animated properties created by DiC. Stevenson’s story for children. Animation production by the Hong Ying Universe Company, headquartered in Taipei with offices in Suzhou, Hollywood, and Paris, for DiC. “Fun facts with Inspector Gadget”, a DiC property, added, Rereleased on DVD by MGM Home Entertainment. A very close adaptation of Stevenson’s novel, with a prologue added showing Captain Flint’s crew objecting to his burying the treasure for himself instead of sharing it with them. The video clip here shows this prologue alone. 24. The Return to Treasure Island. June 20, 2006. 73 minutes. If it involves “more adventures at sea”, and it teams up Jim Hawkins with Billy Bones, who was killed off before Long John Silver entered the original story, it is indeed a sequel. 25. Treasure Island. Production: Digiview Entertainment. 2006. 45 minutes. Classic Fables. A “Classic Fables” DVD. Apparently a straightforward adaptation of Stevenson’s novel, although the DVD blurb says, “Jim decides to take the map to the local magistrate and the magistrate commissions a ship captained by the legendary Long John Silver.” Assuming that the blurb-writer did not get it wrong, if Silver is the ship’s captain rather than its cook, this is a change of the story. 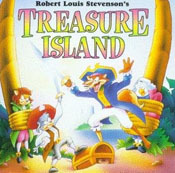 There have been many other Treasure Island very loose adaptations in animated TV series, such as an episode of the 1983-1991 Alvin and the Chipmunks TV series in which Dave reads the novel to the three chipmunks; and two episodes of the 2000-present Dora the Explorer TV series, one where a Pirate Parrot tells Dora and Boots the monkey about an island with a treasure chest full of gold, chocolate cupcakes with pink frosting, and other goodies, and one where Dora and her friends are performing a musical about pirates, the chest with their costumes is stolen, and they must pursue it to Treasure Island to get it back. But these are not separate productions. That’s all – so far. I still know it as Kiev, do I need to change? I hate revising my geography. Well, the Ukrainians will be really happy if you spell their capital city as Kyiv, although as I say, everyone in America still uses the Russian spelling. It’s like in the 1920s, when Brazil officially changed its spelling to Brasil. For a couple of years, some Americans went along with it — I think that the Chicago Tribune used the ‘s’ spelling — but when most Americans and the U.S. government ignored the change, everyone went back to the old ‘z’ spelling. Learned something new today, thanks Fred! The story is padded with magic and such characters as ghosts, devils, mermaids & mermen. They certainly took it in the fantasy/paranormal route with this telling of the story. The only thing I didn’t care for was making Silver a straight-out villain simply because I enjoyed this character well (making him a fox suited him fine), too bad they didn’t try to redeem him a bit in the second season. Certainly played it pretty dark and mysterious at times though thepacing tend to be rather frantic in that first season (not to mention a couple episodes being farmed out to another studio I thought did better work than who they were mostly using at the time). That 1997 compilation video of the first series was the best we got here in the US on VHS, but I suppose we can be content with the episodes up on YouTube anyway if we must. it should be noted the unmade Mickey / Donald / Goofy feature — adapted into the epic Duck comic “Pirate Gold” — owes a lot to Stevenson: The stranger with a map, a ship manned by hidden villains, and the actual hunt on the island. Also, Filmation did a feature version in 1972 that’s still on DVD from Warner. And “The Famous Adventures of Mister Magoo” cast the star as Long John Silver. There were already covered last week but thanks for reminding us. Another note: While the book and the MGM version with Wallace Beery gave Jim Hawkins two parents, most adaptations make Jim fatherless or an orphan to put some weight behind his hero worship of Silver. “Treasure Planet” pushed that idea up into the spotlight, emphasizing that Jim’s father actually walked out. That made Silver’s betrayal a much bigger deal, especially after he seemed to be consciously stepping into the role of father figure. 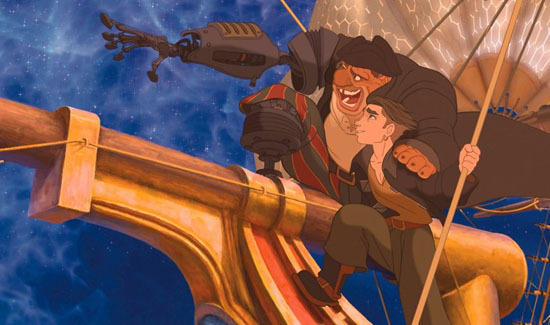 The character of BEN wrecks an otherwise good Treasure Planet for me; too loud and way over-the-top. Not the slightest funny or comic relief. There’s some interesting work on the DVD like William Shatner doing narration for Treasure Planet. I didn’t think BEN was bad. I mean Ben Gunn was supposed to be crazy in the first place. Granted, there were shades of Genie there, but considering it was the same directors that isn’t so surprising. Treasure Planet is one of my absolute all time favorite Disney flicks. I enjoyed it as well too, recall seeing that on the big screen and had a good time with it. You missed one version of Treasure Island: the Bulgarian version of “Treasure Planet” which is called Planetata na sakrovishtata. Every weekend i used to pay a visit this website, because i want enjoyment, as this this website conations truly nice funny information too.